When I was a vegetarian, I didn’t miss steak, had no desire to eat buffalo wings and couldn’t understand why people were so obsessed with pulled pork. Then Smoque opened in Bailey’s Corner in the city and my years of happily choosing tofu over meat were over – I was devouring pork ribs within minutes on my first visit. With my vegetarian days firmly behind me, Smoque is one of my favourite casual dining restaurants. 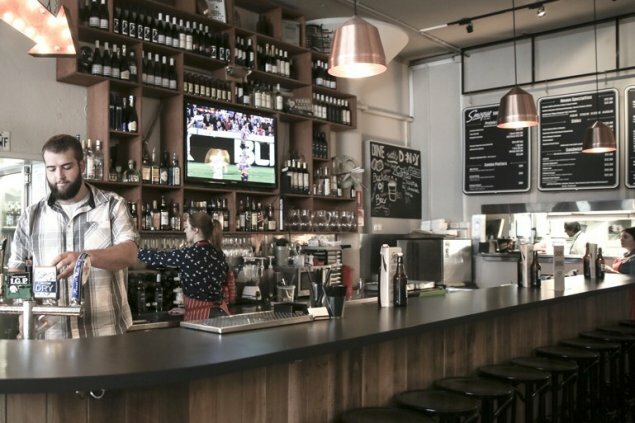 For several months last year my partner and I ate at Smoque at least once a week, so few were as pleased as we were when a second location opened in Woden. Both the Civic and Woden restaurants offer a lunch and early bird dinner special where you can order any burger with a small side, garden salad or three buffalo wings for $15. I don’t usually order the burgers when I go to Smoque as I like the protein plates (starting at $9.90 for Kansas City chicken, cornbread and a pickle) and the combo platters ($39 to $99, depending on how many different meats you’d like on your plate). It’s a shame really, as the burgers are delicious. 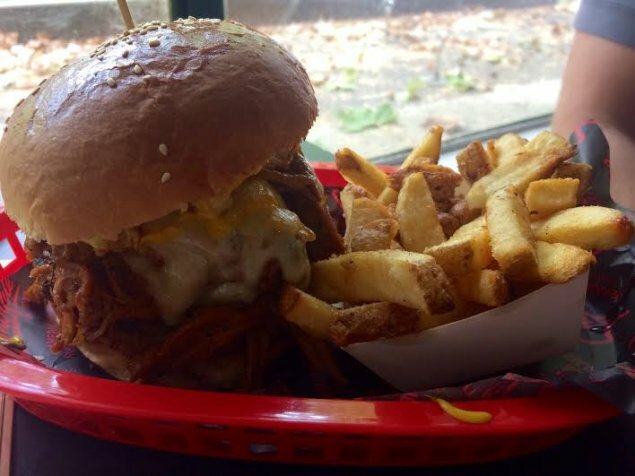 As you might expect, they have a distinctly Southern flavour – think pulled pork with BBQ sauce and coleslaw ($11.90); smoked mushroom with pumpkin, onion, zucchini and rocket ($13.90) and brisket with cream cheese, jalapenos and smoked capsicum ($14.90). 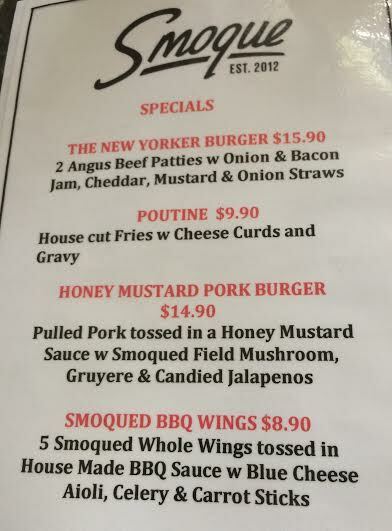 These were tempting options, but on this visit it was the honey mustard pork burger (pulled pork tossed in honey mustard sauce with smoked field mushrooms, gruyere and candied jalapenos, $14.90) on the specials board that caught our attention. I placed our orders at the front counter, making a mental note to try the advertised peanut butter and bacon ice cream special on a future visit as I did so. The restaurant was quite busy for a weekday lunch, and our food took about 15 minutes to arrive. We chose an indoor table upstairs (we were at the Civic restaurant) and had a nice view of passersby to keep us occupied. The chefs packed so much pulled pork and cheese onto each burger that I struggled to finish mine – and I can put away a horrifying amount of food in one sitting. If you aren’t raging hungry, you could even skip the sides and just enjoy the burger. 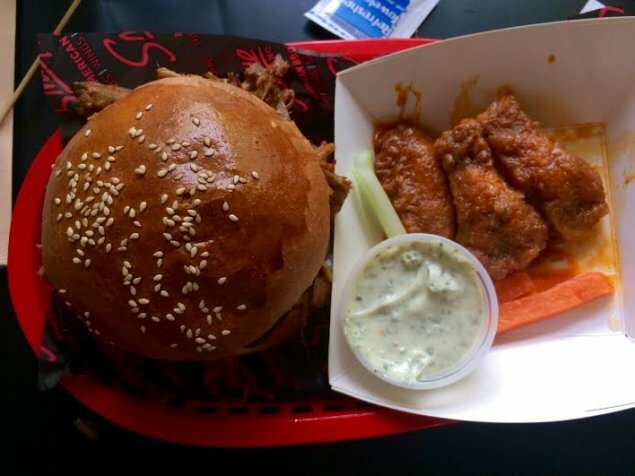 Three buffalo wings and a gigantic burger is a big lunch, especially for $15! Smoque’s lunch and early bird dinner specials are available Monday to Thursday for lunch and every night for dinner before 6pm.